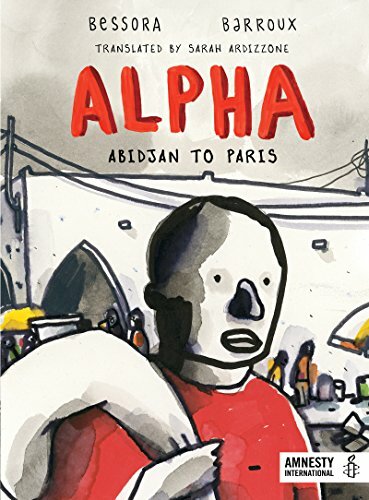 Alpha: Abidjan to Paris tells the story of the refugees’ struggle from up close and personal through the character of Alpha, a cabinet maker in the Cote d'Ivore, the Ivory Coast. Alpha's wife and young son have already left the poverty of their home, hoping to join the wife's sister in Paris, at her beauty salon near the Gare de Nord train station. Alpha, desperately missing his family, tries to get a tourist visa to visti France, but the bureaucracy is Kafkaesque, clearly intended to keep people out rather than guide them legally in. Which leaves Alpha no choice but to take the risky, expensive illegal route. Other graphic novels provide a more visceral sense of life in Cote d'Ivoire, most notably the Aya series by Marguerite Abouet, illustrated by Clement Aubrerie. Through Aya, her family, friends, neighbors, and community, the reader gains a colorful entree into daily life, from school to work to the bar and restaurant scene. Joann Sfar's The Rabbi's Cat series takes place in country that could be Algeria or Morocco. Although less topical than Aya, these books also paint a picture of a distinctive culture, time, and place. Alpha: Abidjan to Paris provides none of that. There's no sense of daily life in Cote d'Ivoire, no sense of the family and community Alpha must say goodbye to, no sense of what he's missing by leaving. As he moves from Abidjan to Mali to Algeria to Morocco, there's no evocation of specific places, just the long journey. Even the various refugee camps where Alpha stays don't have a distinctive character. What is distinctive, what's powerful about Alpha's story, is his sheer determination and desperation. Alpha calls himself an “adventurer,” not a refugee, but he and his fellow travelers are looking for a better life, not a fun experience. They are willing to risk everything for that chance and it is that intense drive that vibrates through these pages. Anyone who is curious about the waves of immigrants coming from Africa into Europe will gain a better understanding of what drives them, of the dangers they face, and the politics that try to barricade them. Alpha is the story of everyone who bravely risks all they know for the hope of a better future. The art in the book makes the bleak story more accessible, though this is not an easy read. Honest and direct rather than inspiring and romantic, Alpha gives a name and face to the multitudes in refugee camps all over the world. An important story for all of us to know.